Few minutes old. 7 little kits. 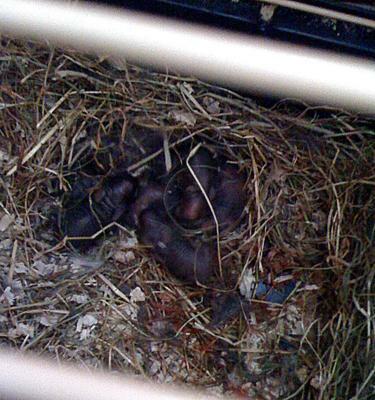 Day 6 - Having a snooze in the nest. Getting bigger each day. Hey, I just want to say thanks for your website. My rabbit gave birth to her first litter last Friday, all 7 kits have survived and both mother and babies seem to be healthy. 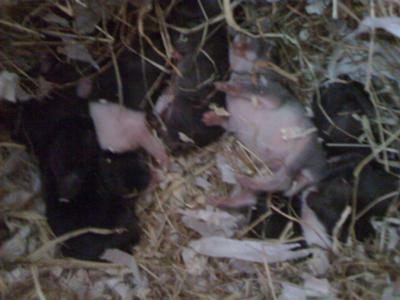 I was a newbie to birth, baby rabbits, the whole thing. Your website has been extremely helpful and without your website I think I would be completely lost on what to do, how to check the kits correctly etc. So thanks a lot. I've attached a few pictures of the 7 kits =]. Totally cute! Looks like they are Dutch crosses. Good luck with your new babies!